Patience is a virtue, but not when it comes to getting rid of acne. Everyone wants quick relief from blemishes. Will Dermalogica Special Clearing Booster give you that relief? Before we can determine that, we need to take a closer look at the ingredients. he Dermalogica Special Clearing Booster is acne spot treatment used to accelerate the breakout clearing and help protect the skin from further flare-ups.Dermalogica is a skincare brand with a variety of products that help you get healthier looking skin. Coinciding with the brand, the Special Clearing Booster is supposed to heal acne and shield the skin for a clearer complexion. The power behind the serum is reliant on 5% benzoyl peroxide. Benzoyl peroxide is a common over-the-counter medication for acne. Benzoyl peroxide has antibacterial properties and helps increase skin cell turnover to clear pores. Alongside benzoyl peroxide the formula includes zinc sulfate, tea tree and sage. These three ingredients work as hydrating and soothing agents for the skin. Is Dermalogica Special Clearing Booster Safe? Because benzoyl peroxide can cause redness, dry skin and skin irritation the addition of these ingredients helps alleviate the potential side effects. 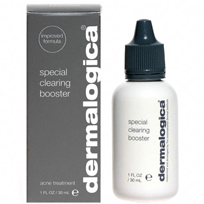 As a spot treatment, the Dermalogica Special Clearing Booster can help accelerate the natural healing process. The serum lacks any ingredients to help protect the skin, but it can help purify the skin. There are, however, alternative treatments that are more cost efficient than the serum. The Special Clearing Booster retails for $44 and there are cheaper alternative with comparable formulas for the same results.